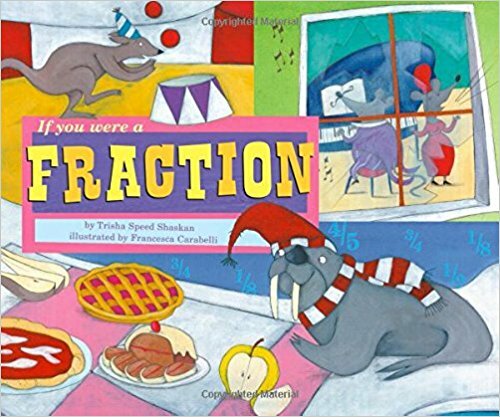 We love to incorporate fraction read alouds, along with a range of manipulatives, into lessons on fractions to ensure that our students develop a conceptual understanding of this topic. 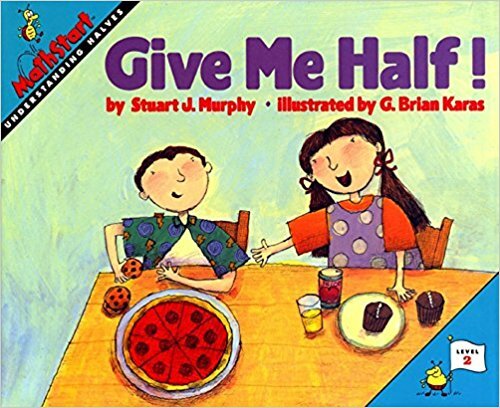 Below we've reviewed some of our favorite picture books for bringing fractions to life when introducing and/or reviewing fraction concepts. Look for these fraction read alouds in your library or use the links below to purchase a copy from Amazon. Set in ancient China, this story brings to life the puzzle of the tangram. An artist presents a warlord with a gift of a beautiful blue tile. However, when the artist accidentally drops the tile it breaks into seven pieces and he is unable to put it back together again. 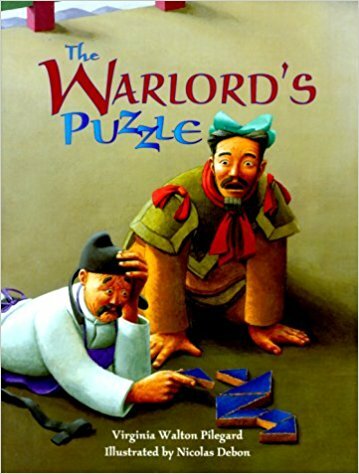 To appease the warlord’s anger the artist suggests that the warlord hold a contest to see if someone can be found to put the tile back together. A huge line of people soon forms to try their luck, with the warlord proclaiming that whoever puts the tile back together will receive a treasure and come to live in the palace. 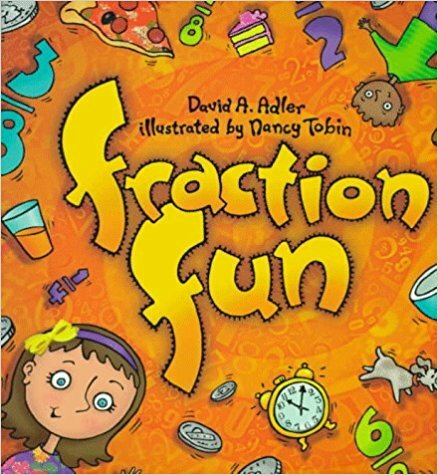 We’ve used this book in a range of 3rd-5th grade classrooms for a hands on lesson that combines geometry and fractions. After working in partnerships to solve the “broken tile puzzle” students determined what fraction of the whole each piece represented and justified their thinking. Miss Bloom runs the Strawberry Inn, and she loves visitors: she has one room for herself, “and five for her guests” - “six rooms in all for a cozy night’s rest.” As the guests begin to check in for the night, the story explains what fraction of the Inn is occupied, until all six rooms are taken and it’s a full house. After a delicious dinner, the guests head upstairs to bed - until, that is, they’re tempted back downstairs for a midnight snack! 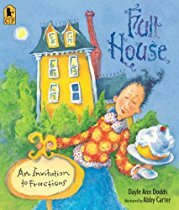 With whimsical illustrations, fun characters, great vocabulary extensions (“scrumptious,” “partake,” “astonishing”) and humorous text that rhymes and repeats, Full House is a popular fraction read aloud, that successfully introduces the concept of a fraction of a whole. Possible extension activities abound, including this sample which is suitable for students working on adding and/or multiplying fractions with like denominators. Art or math? Why not both! 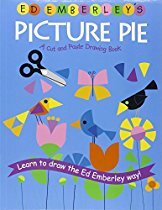 Caldecott Medalist Ed Emberly’s classic Picture Pie is the perfect basis for a fun, engaging art lesson, and a sneaky introduction to or reinforcement of students’ knowledge and understanding of fractions. At the outset, the book shows how a mere circle, divided like a pie - in halves, quarters and eighths - can be used to make pictures of all kinds. The pictures range from complex and visually striking patterns to simple but adorable animals - a cute mouse, for example, is created using four different one-eighth pieces of a pie (with a tail, whiskers and legs drawn on in pencil for additional impact). The possibilities presented for fraction work are numerous, spanning young learners to third and fourth graders and beyond. In addition to fractions, this book also supports work with shapes and patterns - and is of course a valuable art resource. Students will enjoy working on their creations, and the end result is sure to be worthy of prominent display on a math bulletin board. 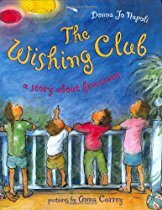 The nocturnal magic of a wishing star is the focus of Donna Jo Napoli’s The Wishing Club. But there’s something different about this star, as the four children soon discover: curiously, it only grants partial wishes (half a cookie instead of a whole, a quarter, instead of a dollar), and there seems to be a pattern to it. So the siblings set about the task of discovering the pattern and making their collective wish come true, thus weaving math into a charming story in a way that feels natural and genuine. Along the way, the reader is invited to follow the number patterns represented in small diagrams, but Anne Currey’s beautiful ink and watercolor illustrations of the children on their porch wishing on the star under the night sky ensure that the magic of the story is not lost. A great fraction read aloud to use for extension activities, many of which are included as suggested activities at the back of the book. In this story an inchworm happily measures various vegetables in the garden until one day she discovers that she cannot measure a cucumber that is more than two, but less than three, worms long. Luckily a worm half her length appears and together they are able to measure the cucumber. 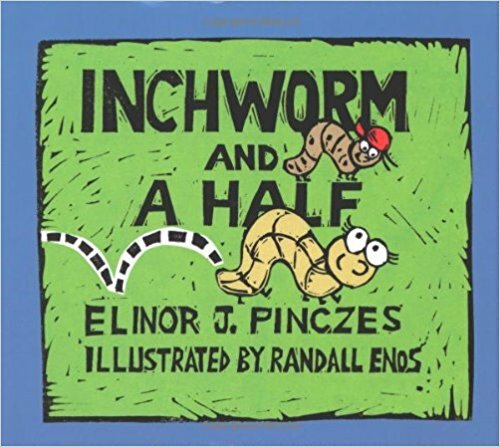 As the story progresses the inchworm also enlists the help of 1/3-inch and 1/4-inch worms in her quest to measure all the vegetables in her garden. We’ve used this fraction read aloud to introduce measuring lengths using rulers marked with halves and fourths of an inch in third grade. Students had fun working with a partner to measure different vegetables to the nearest half or quarter inch and there was lots of lively discussion about the names of the different vegetables when it came time to record their findings. When the little ant is invited to the generous lion’s annual dinner party for the first time, she is focused on making sure that she is a considerate guest. When she arrives at the party, however, she is astonished by the bad behavior of the other guests: they arrive late, they talk only about themselves, and they make a huge mess. Worst of all, when the lion presents a beautiful cake for dessert, the animals “share” the cake in a most unequal way. The elephant takes half of the original cake and passes on the remaining half. The hippo takes half of that piece, a quarter of the original cake, and passes the remainder to the gorilla who takes another half, an eighth of the original. The cake continues around the table, each animal continuing to take half, until it reaches the ant who receives a crumb to share with her kind host. Horrified, the ant promises to bake the lion a new cake, but even this act of generosity snowballs into a competition of doubling, culminating in the elephant promising to bake the lion 256 peanut-butter pound cakes. This lovely story has the feel of an Aesop fable, is beautifully illustrated, and - most importantly - is jam-packed with math! Fractions are the star here, beautifully demonstrated in picture form, but there’s plenty of multiplication and division too. 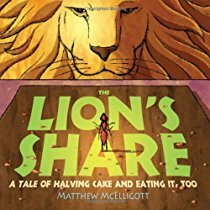 And, for good measure, there’s a lesson about fairness, justice and decency that elevates The Lion’s Share above the usual fraction read aloud. After reading, follow up with this task to review naming fractions of a whole or to introduce the concept of multiplying a fraction by a fraction. 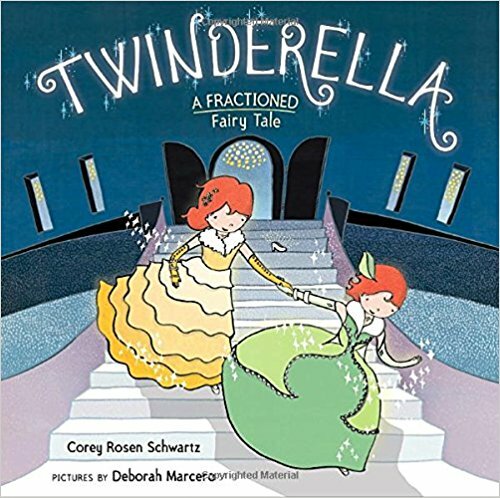 A 'must have' fraction read aloud for your math literature collection. 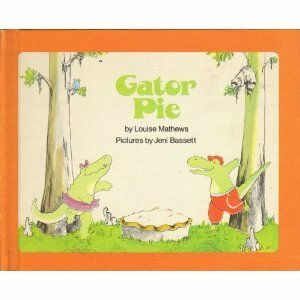 In this story two alligators, Alvin and Alice, find a large chocolate-marshmallow pie on a picnic table near the edge of the swamp. As they prepare to cut the pie in half another alligator appears and demands his share. As the story continues, more and more alligators appear and Alvin and Alice are forced to repeatedly reconsider what fraction of the pie each alligator should receive. Finally, after an army of alligators appear, Alice carefully cuts the pie into one hundred one-hundredths only to have the alligators begin to disagree over which is the biggest slice. In the ensuing commotion Alvin and Alice run off with the pie and consume fifty slices ("exactly one-half of the pie") each. 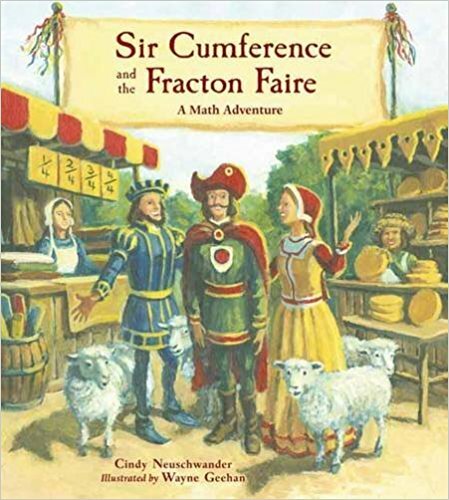 Although now out of print, this remains a favorite fraction read aloud to use during lessons on recognizing and representing unit fractions. We sometimes also revisit the story during lessons on equivalent fractions. You may be able to find it in your library or pick up a second hand copy cheaply.